A couple of weeks back we checked out a very interesting looking upcoming original fighting game for the iOS platform called Cool Clash (Free), and skirting the typical Thursday release schedule the game is now available in the App Store. The immediately noticeable thing about Cool Clash is how brilliantly animated it is. The characters and backgrounds are all hand-drawn, and in motion it looks like you’re playing an actual cartoon. 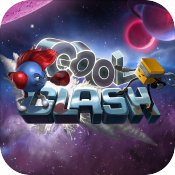 The other notable aspect of Cool Clash is its unique touch controls. Rather than rely on a set of virtual buttons, Cool Clash uses a very clever swipe gesture system. Diagonal swipes control heavy high hits, heavy low hits, blocking and throwing. Simply tapping performs light hits, with a tap>hold>drag motion performing a special move. In addition, the way jumping is handled in Cool Clash is also very unique. What would normally be the UP direction on a d-pad is replaced with an arc-shaped button. Where you touch on the arc will relate to what angle you’ll jump, and you can either tap the button for a short hop or hold it down to perform a huge leap into the air. The control system is pretty simple to understand, and in my short time with Cool Clash so far I’ve found it to work incredibly well. The swiping gestures feel natural and can lead into many cool combos. It’s early, but I really can’t believe how much I’m enjoying playing Cool Clash. From the visuals, to the controls, to the high production values throughout, you would be forgiven thinking this release was from one of the big boy developers, rather than a team of two who have been laboring away for the past 4 years. 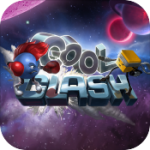 You can hear more early impressions and discussion in our forums and there’s a free lite version of Cool Clash to download and try without risk, so if you dig fighting games or are just interested to check out developer Foxy Robot‘s take on the genre don’t hesitate to give it a look. An original fighting game for iOS with THOUSANDS of hand-drawn frames of animation!